I make large custom, commissioned wall mounted Wire Murals for public, commercial, and residential locations. I’ve completed projects for hospitals, hotels, restaurants, convention centers and other public centers throughout the United States. I have also developed private personalized sculptures for people's homes and offices. I bend 5/32-inch diameter (9 gauge) steel wire by hand, then weld and powder coat my creation with an all-weather, UV resistant finish. The wire wall murals can be hung temporarily on hooks or mounted permanently on wall anchors. Sizes range from 4 to 100 feet wide. I’ve been making abbreviated line drawings of just about any subject on just about any surface in just about any medium since I can remember. 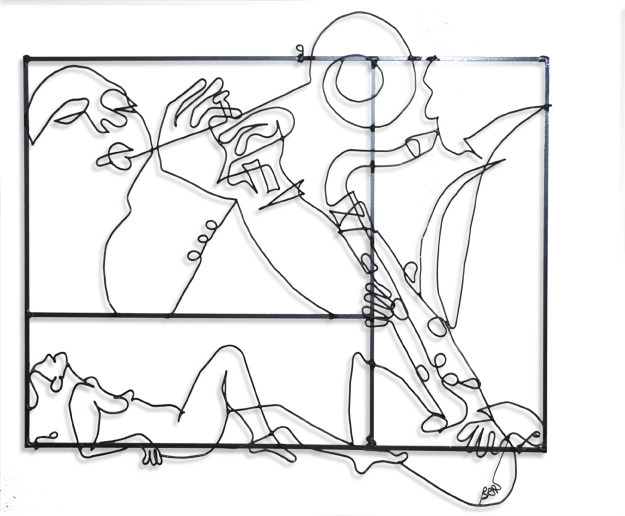 After being inspired by Alexander Calder, I started using wire as my drawing medium of choice in 1972 and have been making Wire Wall Murals on a commission basis ever since. A Wire Wall Mural is the final step in a simplification process that starts with a photograph or group of photographs. 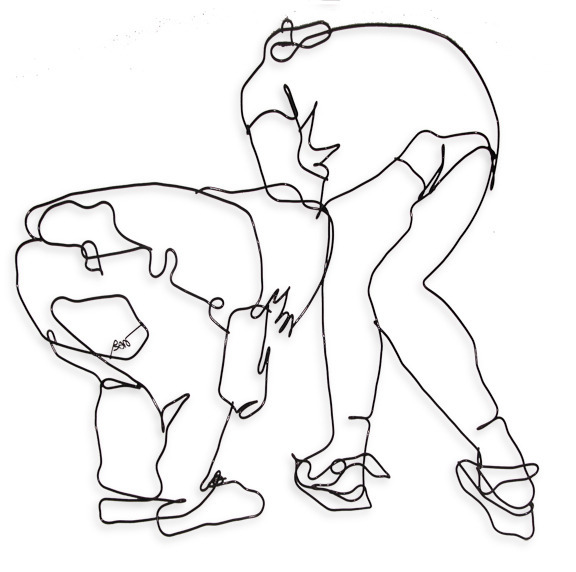 I make and remake the line drawing to emphasize only the essence of the subject. I ask, myself: "What is it about this image that makes it unique." Then I strip away the lines that are not required to convey that quality. Finally, like the poet who reviews every word, I re-examine every turn and curve as I bend the wire into that image -- a large line drawing in space. The final installation, a solid line in front of a moving shadow, has scale enough to suit a large space without dominating the room. 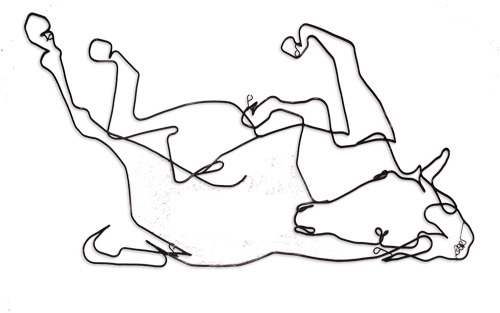 After I make a wire wall sculpture I hang it up and "live with it" for a while. Sometimes I cut away additional material, add more, or change bends before I consider the sculpture ready for a home, gallery, or museum. I say: Nothing is permanent, as long as you have pliers. Bart Soutendijk makes murals for public, commercial, and residential locations out of wire – his drawing medium of choice. 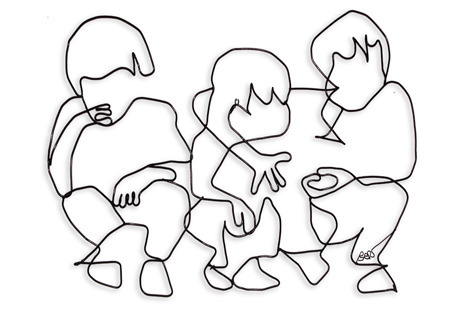 The wire pieces are the final step in a simplification process that starts with a photograph or group of photographs. 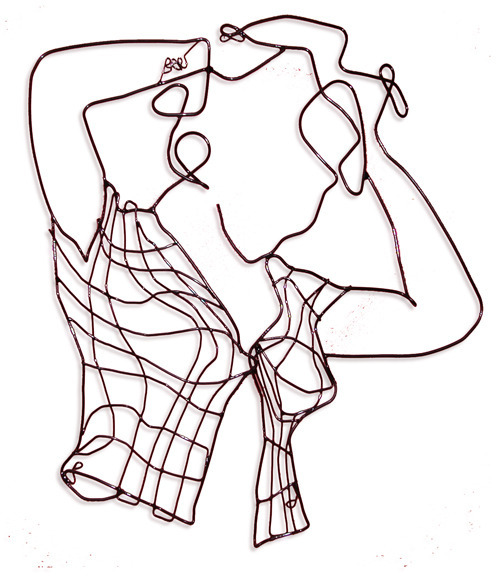 He makes and remakes a digital line drawing to emphasize only the essence of the subject, then, like the poet who reviews every word, he re-examines every turn and curve as he bends the wire into a sculpture. The final installation, a solid line in space in front of a moving shadow, has scale enough to suit a large wall without dominating the room. His work has been purchased by collectors from all over the world. Wire wall mural made of 9 gauge steel wire, powder coated gloss black. 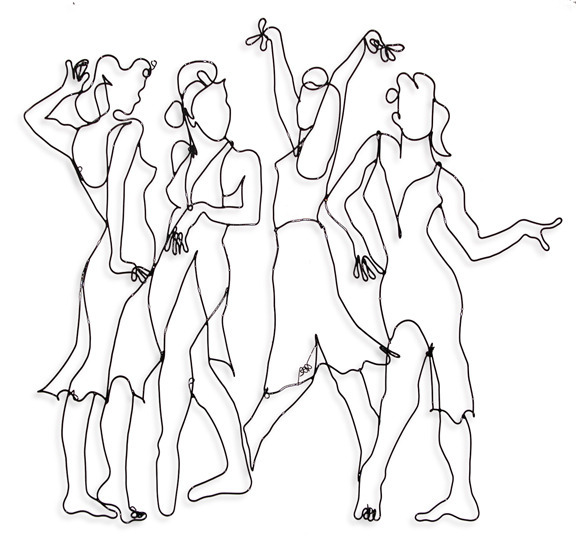 Wire wall mural made of 9 gauige steel wire, powder coated gloss black.